The chapters in this volume represent a compilation of the material presented by the invited speakers at a short course on August 21-23, 2011 called Sulfur in Magmas and Melts and its Importance for Natural and Technical Processes held at the Hotel der Achtermann, in Goslar, Germany following the 2011 Goldschmidt Conference in Prague, Czech Republic. Sulfur is one of the most abundant volatiles in terrestrial magmas. During volcanic eruptions, large amounts of sulfur are released to the atmosphere, mostly as SO2 and H2S, which have important climatic impacts. Sulfur also has significant effects on the partitioning of a wide variety of elements between silicate melts, liquid metals, gases, and solids, and consequently magmatic sulfur species exert major controls on the genesis of a large variety of ore deposits. Physicochemical processes involving sulfur also affected the evolution of the early solar system. Furthermore, sulfur plays important roles in technical processes involved in glass and steel production. In glass manufacturing, sulfate is often added for fining of glass melts, i.e., to remove bubbles which would otherwise cause significant quality degradation, and sulfur also influences the color of industrial glass. In steel production, molten metals are forced to interact with silicate slag melts for desulfurization which is required to produce high-performance steel. Although the specific problems related to sulfur in silicate melts vary between natural and industrial applications, the underlying physicochemical processes are nevertheless the same. The solubility of sulfur-bearing minerals and the partitioning of sulfur between coexisting phases (e.g., a melt and gas phase) determine how much sulfur can be dissolved in or extracted from melts. Moreover, the diffusivity of sulfur in melts exerts a major control on the formation of bubbles and on the kinetics of mineral dissolution and growth. It is also important to bear in mind that the behavior of sulfur in silicate melts is much more complex than that of other volatiles, such as water and carbon dioxide, because sulfur dissolves in silicate melts in at least two different oxidation states. At low oxygen fugacities below that of the nickel-nickel oxide oxygen buffer, sulfide (S2-) is the predominant sulfur species whereas at higher oxygen fugacities sulfate (SO42-) is dominant. Other species such as sulfite (S4+) may exist as well at specific conditions. As a consequence of the multi-species behavior of sulfur, it is often difficult to model and sometimes difficult to predict the behavior of sulfur in natural and industrial processes. Complex reactions which are coupled to other oxidation-reduction equilibria (e.g., those involving heterovalent cations such as iron) can occur due to changes in the oxidation state of sulfur. For instance, during the degassing of silicate melt at very high temperature and atmospheric pressure, sulfate becomes instable and dissociates forming sulfur dioxide and oxygen, and the latter species are able to oxidize ferrous to ferric iron. In chapter 2, an overview on methods for quantifying the sulfur contents of glasses, minerals, and other solid phases is given by Ripley et al. (2011, this volume). The most common technique to gain information about the spatial distribution of sulfur in condensed matter is still electron microprobe analysis (EMPA), but other methods, i.e., laser-ablation combined with mass spectrometry (LA-ICPMS) or optical emission spectrometry and secondary ion mass spectrometry (SIMS) are also frequently used tools. X-ray fluorescence (XRF) is a widely employed method for analysis of rocks, owing to its ability to simultaneously analyze a wide range of elements in different matrices with a modest level of sample preparation. This chapter also describes nuclear reaction analysis, which involves bombardment of material with a high-energy beam and subsequent detection of gamma radiation, as another technique used to measure samples with very low sulfur concentrations. Issues bearing on proper standards, analytical detection limits, and analytical uncertainties are also discussed. In chapter 3, Wilke et al. (2011, this volume) report on the significant progress that has been made in the last few years in the characterization of sulfur speciation in glasses by spectroscopic techniques. X-ray absorption spectroscopy (XAS) is the most commonly used tool. This method can clearly distinguish oxidation states of sulfur in the glasses and yields information about the coordination of sulfur, but quantitative interpretation of XAS spectra in terms of relative proportions of sulfur species in glasses is still in its early stages and requires additional calibration work. Magic-angle spinning nuclear magnetic resonance spectroscopy (MAS NMR) also has the potential to yield insights into the coordination and the oxidation states of sulfur in glasses, but its application is limited by the low natural abundance of the sulfur isotope 33S used in NMR measurements. Recently, Raman spectroscopy has been intensively applied to study sulfur speciation, i.e., to analyze specific bands of sulfide, sulfate, and hydrogen sulfide in glasses. However, as described by Wilke et al., this technique is applicable only for specific melt compositions and at sulfur contents exceeding several hundreds of ppm by weight. A variety of processes in magmas and melts are controlled by sulfur diffusion and oxidation-reduction reactions of sulfur in the melt, and an overview on this topic is given in chapter 4 by Behrens and Stelling (2011, this volume). Close inspection of data in the published literature implies that differences in sulfur speciation, i.e., whether sulfide or sulfate is the dominant sulfur species in melts, have little influence on the mobility of sulfur in the melts. The evaluation of results of experimental studies in this chapter does, however, provide evidence that sulfur diffusion is strongly coupled to the dynamics of the silicate network and, hence, to the viscosity of the melt. It is shown that the Eyring relationship, which relates diffusivity to viscosity, is a good tool for predicting sulfur diffusivity in the melts. The kinetic issues of melting of raw materials in industrial glass manufacturing are described in chapter 5 by Falcone et al. (2011, this volume). During the production of soda-lime-silicate glass, sulfur-containing raw materials (sulfates and sulfides) are added to improve the quality of the final product; sulfate is used for fining of glass melts, i.e., to remove bubbles from the glass batch. In addition, the oxidation-reduction conditions during glass melting and minor contents of iron exert major controls on the color of the glass products. In particular, the amber color of glasses is attributed to chemical associations, such as Fe3+-S2-, which are stable only in a narrow range of oxygen fugacity, the latter of which can be established by adding specific amounts of carbon sources to the raw materials prior to melting. It has long been of interest to predict the solubility of sulfur in silicate melts under the conditions relevant to glass and steel production as well as for natural processes. In chapter 6, Backnaes and Deubener (2011, this volume) give an overview of experimental results improving industrial glass or steel production. Particular attention is given to experiments on the equilibration of gas mixtures with silicate melts and on the effects of adding reducing agents such as carbon to the melt at ambient pressure. It is noted that the measured quantities of sulfur in the melt typically do not represent equilibrium conditions but instead are affected by kinetic factors such as diffusion and convection in the melt. Nevertheless, such experiments provide useful information on how different chemical components affect the ability of the melt to bind sulfur species. A variation in oxygen fugacity in the gas mixtures in contact with the melts at constant sulfur fugacity demonstrates that sulfur solubility is particularly high when sulfate is the stable sulfur species. High sulfur concentrations in the melts are also achieved when equilibrating silicate melts with gas mixtures under reducing conditions, and a distinctly V-shaped solubility curve for sulfur in the melt as a function of the logarithm of oxygen fugacity in the gas phase is often observed at ambient pressure. 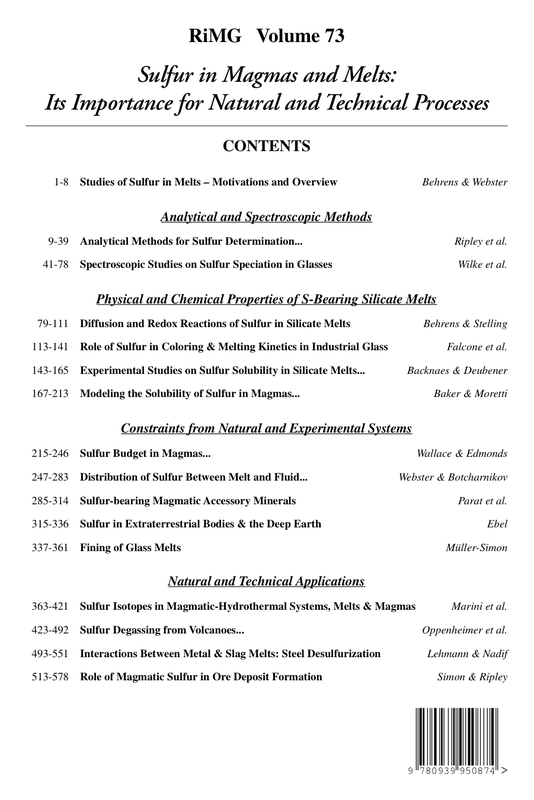 Useful approaches to estimate the solubility of sulfur in silicate melts relevant to natural systems are given in chapter 7 by Baker and Moretti (2011, this volume). Empirical models which reproduce experimental data accurately have been tested, but these models may have large uncertainties when extrapolated to conditions which are far from those covered by the experimental data. Thermodynamic models have been constructed and are more applicable and useful for extrapolation out of the range of the supporting experimental data. In particular, a new model is proposed by Baker and Moretti (2011, this volume) for prediction of sulfur capacity at anhydride saturation (SCAS) in silicate melts. As detailed in chapter 8 by Wallace and Edmonds (2011, this volume), silicate melt inclusions trapped in minerals provide the opportunity to investigate processes of magma evolution and subsequent eruptive processes. Silica-rich melts are characterized by relatively low sulfur solubilities, so it is clear that the recharge of mafic magma with more chemically evolved magmas (some of which may be saturated in vapor) contributes to the volatile budget of at least some intermediate and silicic volcanoes. Characteristic ranges in S content of pillow-basalt rim glasses and melt inclusions collected from mid-ocean ridge basalts (MORB) and basaltic arc magmas are summarized. This chapter addresses mafic magmas that are able to mingle and mix efficiently with resident magmas. It also describes how and why the mixed magmas associated with mafic recharge are usually highly oxidized and silicic in composition which promotes sulfur partitioning into the vapor phase. The sulfur data from melt inclusions are used to interpret volatile recycling in subduction zones, compositions of pre-eruptive volcanic gases, and the "excess sulfur" problem associated with some eruptive systems. The partitioning of sulfur between fluids and melts, as reviewed in chapter 9 by Webster and Botcharnikov (2011, this volume), controls the volatile budget of magmas and sulfur release on volcanic degassing. In general, sulfur is preferentially incorporated in a magmatic fluid phase, i.e., fluid/melt partition coefficients are larger than 1 and even may reach values of 1000 or more. Temperature, pressure, and oxygen and sulfur fugacities as well as fluid and melt composition affect the fluid/melt partitioning of sulfur. Typically, silica-rich melts (e.g., rhyolitic melts) display larger S partition coefficients than silica-poor (e.g., basaltic) melts. With knowledge of the partitioning behavior of sulfur, the measurements of magmatic gas compositions may be used as an indicator of magma degassing activity and style. Fluids generated in magmatic systems are usually composed of various components in the system S-O-H-C-Cl, but other halogens and N may also be involved, and as described in this chapter, experimental research on sulfur partitioning at elevated pressures between silicate melts and complex multi-component fluids is insufficient, at present, to model degassing in all magmas. An overview on the importance and role of sulfur-bearing minerals in magmas is given in chapter 10 by Parat et al. (2011, this volume). As described therein, S-bearing minerals represent only a negligible component of the mineral assemblage in magmatic rocks, and hence, are accessory minerals. In most cases, these S-bearing accessory phases are iron sulfides, typically pyrrhotite, but chalcopyrite, pentlandite, sphalerite or molybdenite also occur. Among sulfate minerals that are stable in magmatic systems, anhydrite is the most common phase. Other magmatic SO4-bearing minerals include S-rich apatite, haüyne/sodalite, and silvialite. Despite the small abundance of these S-bearing minerals, they are extremely useful for estimating the activity of various sulfur-bearing species in the magmas, to constrain oxygen fugacity and the S concentration in magmas prior to eruption and degassing (e.g., pre-eruptive sulfur concentration in melts). In chapter 11, Ebel (2011, this volume) addresses the current understanding of sulfur in extraterrestrial bodies and in the deep Earth. Our knowledge on the abundances of S, C, N, O, and other volatile components in the solar system is based mainly on meteorite data combined with spectroscopic measurements of the solar photosphere. However, sampling of comets in the NASA Stardust mission and experimental studies, i.e., on element partitioning between metals, metal liquids, silicate and silicate melts, at high pressures also provide useful information. The solar abundance of S expressed by the ratio of (S/(Fe+Ni+Co)) is approximately 0.5. It is preserved at least in the carbonaceous chondrites (CI) and perhaps also in comets, while the rocky planets and most meteorite parent bodies (asteroids) have either lost or never accreted a significant sulfur component. This chapter describes how silicate melts are involved in nearly every phase of planetary evolution, from accretionary impacts through core/mantle differentiation to volcanism and subduction. While the effect of dissolved sulfur on element partitioning between melt and solid metals has been investigated, it remains an open question about how sulfur affects the partitioning of other elements during core/mantle differentiation. The fining of molten glass, as described in chapter 12 by Müller-Simon (2011, this volume), is an important step in industrial glass manufacturing that is used to improve the quality of glass products. The primary melt may contain numerous bubbles which originate from air trapped in the cavities of the solid starting mixture before melting, and from CO2 that is generated through combustion of organic impurities and the decomposition of carbonates during melting. In the fining process, these bubbles expand by sequestration of other gas-soluble components in the melt facilitating the ascent of the bubbles to the melt-gas interface, so the number of bubbles decreases strongly in the product with heating time. Sulfate salts are often added to the raw material batch for fining of soda-lime silicate melts, which is the most commonly used base composition for container glass, flat glass, fiber glass and glass tableware products. Upon heating to temperatures above 1400 °C, sulfate ions dissociate to sulfur dioxide and oxygen which diffuse into the pre-existing bubbles. As detailed in this chapter, understanding the elementary processes of fining is crucial in optimizing the entire glass-production process. In Chapter 13, Oppenheimer et al. 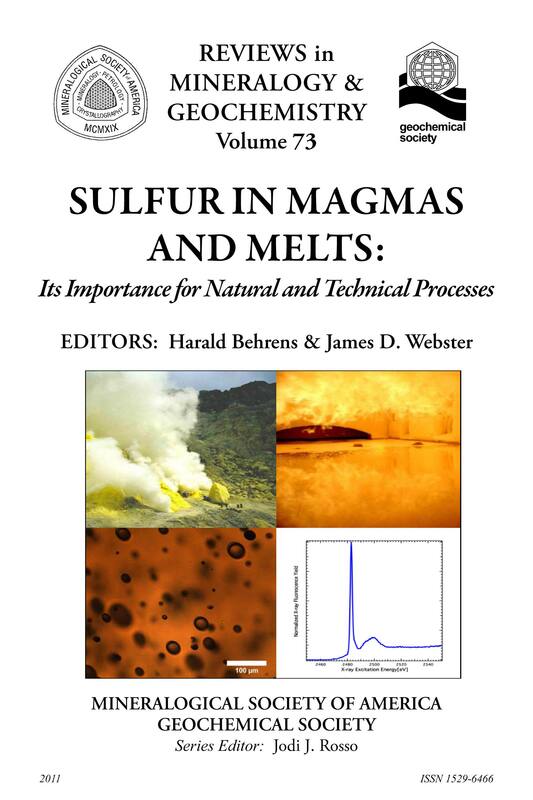 (2011, this volume) discuss sulfur degassing from volcanoes with respect to source conditions in magma, the surveillance of volcanic activities, the chemical composition of released gases, and global impacts of magmatic sulfur release. This review also addresses the speciation of sulfur in volcanic vapors, the causes of variability in sulfur abundance and speciation in different geodynamic contexts, techniques and resulting data in the measurement of sulfur emissions from volcanoes, the links between subsurface processes and surface observations, and the consequences of volcanic sulfur degassing for climate and the environment. The 1991 activity of Mt. Pinatubo is described as a well-documented example of the global impacts of a single major eruption (approximately 10 km3 of erupted material) that has been studied with significant instrumental detail. Although twenty years have already passed since that eruption, it is remarkable to note that new findings concerning its climatic, environmental, and ecological consequences are still emerging. Despite the tremendous insights afforded by this event, it represents only a very small sample of the broad range of volcanic eruption styles, geographic locations, and atmospheric states that combine to produce significant perturbations to atmospheric composition, radiation, and dynamics. Chapter 14, by Marini et al. (2011, this volume), reviews how the stable isotopes of sulfur serve as an important geochemical tool for the study of processes occurring in magma-related, hydrothermal systems, melts, and magmas. Sulfur has four stable isotopes with natural abundances of 95.02% (32S), 0.75% (33S), 4.21% (34S), and 0.02% (36S). Importantly, small variations in the ratios of these isotopes can be induced by kinetic and thermodynamic effects, and these variations or fractionations are exacerbated given the multiple oxidation states of sulfur. The fractionation of sulfur isotopes between co-existing phases is particularly large when the oxidation state of sulfur differs in both phases and when the phases have different aggregate physical states (i.e., gas phases vs. condensed phases). This chapter summarizes how sulfur isotopes have been measured in volcanic gases as well as in samples from magmatic rocks and or magmatic ore deposits. These data are compared with theoretical models of degassing and the crystallization and physical separation of sulfides and anhydrite from melt to gain insights into the processes occurring in magma chambers and during the ascent of the magma to the surface. In particular, this chapter addresses sulfur isotope characteristics for magmas and eruptive products of Mt. Vesuvius, Mt. Mazama, and Mt. Etna. Desulfurization of molten metals by interaction with slags is widely applied in the production of high-quality steel as described in chapter 15 by Lehmann and Nadif (2011, this volume). Sulfur is mainly present in solid steel as manganese sulfide (MnS) inclusions which strongly affect the processing and properties of steel. Since such inclusions behave more plastically than steel during deformation, they act as crack-initiation sites and zones of weakness. Therefore, sulfur is detrimental to the malleability, ductility, toughness, formability, weldability, and corrosion resistance of steels, and hence, very low levels of sulfur (<0.003 to <0.001 wt% S) are required especially for high-quality, flat steel products. Such low-S levels are usually obtained by re-melting the raw metal in a converter with the addition of slags with a high sulfide-capturing capacity. An example slag composition consists of 50 wt% CaO, 18 wt% FeO, and 13 wt% SiO2 plus minor additional components. Understanding the interaction between liquid metal and slag with respect to thermodynamics (i.e., partitioning of sulfur) and kinetics (i.e., exchange reactions between slags and metal liquid and transport within the phases) is crucial for improving the manufacturing processes. A significant body of field, laboratory, and experimental evidence, as reviewed in the final chapter (i.e., 16) by Simon and Ripley (2011, this volume), suggests that sulfur plays a pivotal role in the generation of numerous magmatic and hydrothermal ore deposits. Sulfur is important in controlling the concentration of ore metals in the silicate melt via sequestration of metals in molten and crystallizing sulfides, in controlling the ability of a magmatic-hydrothermal fluid to scavenge ore metals from the silicate melt (by complexing of metals with various sulfur species), in moderating the ability of the hydrothermal fluid to retain and transport ore metals from magma to subsolidus deposition sites, and in controlling the ability of a particular ore metal to precipitate from hydrothermal fluids. Modeling these processes requires detailed knowledge on the speciation of sulfur in the melt, the speciation of metals in sulfur-bearing melts and hydrothermal fluids, and the behavior of sulfur in ore forming H-O-S-Cl fluid(s) at magmatic and sub-magmatic conditions. Furthermore as described in this chapter, redox conditions have a major impact on these properties because the oxidation state of metals and sulfur vary strongly with oxygen fugacity which affects the stability of ore metal complexes in fluids and melts. This physicochemical framework is used to discuss typical ore metal abundances in melts and fluids, the formation of different ore deposit types, their tectonic settings, and the nature of sulfide mineralization. A recurrent observation in all chapters of this volume is that the speciation, and hence the resulting complex chemical and isotopic behaviors, of sulfur in these systems are strongly controlled by the capacity of this volatile to change valence states - potentially over a broad range - in vapor and condensed phases. Recent advances in analytical methods for determining compositional and structural data on sulfur in minerals, fluids, glasses, and melts, for example, have improved our understanding of the principal functions of this volatile component in natural and synthetic systems, but because of the associated chemical complexities there are still many open questions. It should be noted that some of these issues are addressed in the brief recent collection of scientific papers on sulfur in Elements by Métrich and Mandeville (2011). at present, there is no simple, readily available, and accurate means of directly measuring the concentration of S in quenched experimental fluids and in natural fluid inclusions (with potentially broad ranges in S concentrations in chemically complex fluids), but recent developments in the use of laser ablation ICP-MS are promising. Given the problematic nature of quenching melts and fluids, in situ measurements of sulfur dissolution and speciation in fluids and melts of experiments at geologically relevant pressures and temperatures are needed. And, information on interactions between sulfur and other multivalent elements in silicate melts would be particularly beneficial from such experiments. The use of high-spatial resolution, micro-analytical methods (e.g., SIMS) for measuring the stable isotopes of sulfur in silicate glasses has only recently been established, and consequently, there is significant potential and need to apply this new geochemical tool to interpret fluid exsolution and degassing processes through isotopic analyses of sulfur in matrix glasses and silicate melt inclusions. Similarly, we need increased data for sulfur isotopes in individual, and potentially zoned, sulfide and sulfate minerals to better understand magma storage conditions, magma evolution, and degassing. Additional work is required to determine the temporal and spatial distribution of sulfur-bearing gases and particles emitted from volcanoes to the atmosphere. This is very important for sulfur because of its chemical reactivity in volcanic plumes and its key role in forming volcanic aerosols that modify the Earth's albedo. Development and improvement of in situ monitoring techniques are crucial for glass and steel production to reduce the time between observation of manufacturing errors and modifying the production process. Such issues include nickel sulfide-induced breakage of thermally toughened glasses and their prevention by heat-soak-tests, and the relevant feedback times for customers that can reach months (Kasper and Gelderie 2008). Furthermore, acquisition of real-time data on the concentrations of the different sulfur species in the glass melt and information on fining bubbles and the tank atmosphere would help to improve the efficiency of the fining process during glass production. The production of ultra-low-S content steel requires enhancement of the kinetics of desulfurization during steel-slag stirring at atmospheric pressure, and the implementation of in situ measurements is important to assess the gas stirring quality online during this process. Experiments at conditions corresponding to those prevailing in the deep Earth (elevated pressure and temperature) are needed to determine the partitioning of sulfur (and, in particular, its isotopes) and associated chalcophile trace elements between relevant minerals, sulfide melts, and mafic and ultramafic melts. The phase relations of geologically relevant melts saturated in S-bearing fluid and mineral phases require additional investigation, and this is particularly necessary for systems containing C-O-H-S-Cl-F-bearing, chemically complex, geologically relevant fluids. Current understanding of the partitioning of sulfur between these phases at controlled and known fugacities of oxygen and sulfur is particularly poor. Thermodynamic models predicting the dissolution of sulfur in minerals, melts, and fluid phases as well as phase relations in S-bearing systems are crucially needed. Improved thermodynamic models are necessary as a support and a guide for the strategies of future research on sulfur exsolution from melts, on sulfur isotope fractionation and on the role of sulfur-charged vapors and fluids in processes related to volcanic eruption, magma evolution, and mineralization. A Scilab program at the link below computes the sulfur concentration at sulfide saturation (SCSS) using Equation (45) of Baker and Moretti (2011) at oxygen fugacities up to NNO+1.5 and calculates the sulfur concentration at sulfate saturation (SCAS) using Equation (47) of Baker and Moretti (2011) at higher oxygen fugacites. As discussed in Chapter 7, this boundary is an approximation and the exact value depends upon pressure, temperature, and composition, including the concentration of water in the melt. This program does not accurately predict the sulfur concentrations at either sulfide or sulfate saturation in the region where the ratio of dissolved sulfide to sulfate changes rapidly, but it can be used to constrain the possible concentrations of sulfur in a melt saturated with either sulfide or sulfate at these conditions. Both the SCSS model of Liu et al. (2007) and the SCAS model proposed in Baker and Moretti (2011) require some water in the analysis. If a totally anhydrous melt is used as input data, the Scilab program adds 0.001 moles, (~200 ppm) of H2O to the analysis. The program runs in Scilab. Scilab is a freely available "programming environment" that is similar to Matlab and can be downloaded from http://www.scilab.org. This softwares runs under most currently common operating systems on personal computers. Additionally, with only small modifications this program will work in Matlab and in Octave. The great advange of Scilab for many scientists is that it is freely available.